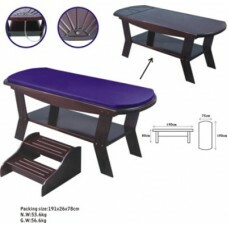 Couch for spa treatments SM-15, buy at the price of 798 in Europe. Attention! On different devices, colors may be displayed a little differently, depending on your monitor! This is a real finding for beautician, because it is not just a table, but a really thoughtful version of the professional furniture. The kit includes an additional water and oil-repellent mattress. That is why the couch SM-15 is an excellent option for manipulation with therapeutic mud. You can quickly prepare a table for mud wraps, putting the mattress on it. And just as quickly remove it, if you should pass the procedure of massage. The mattress is easy to clean and removed from the surface of the table.